CINEBENCH is a real-world cross platform test suite that evaluates your computer's performance capabilities. 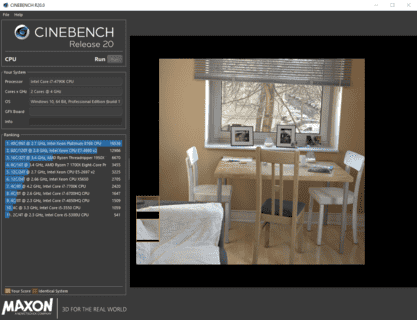 CINEBENCH is based on MAXON's award-winning animation software Cinema 4D, which is used extensively by studios and production houses worldwide for 3D content creation. MAXON software has been used in blockbuster movies such as Iron Man 3, Oblivion, Life of Pi or Prometheus and many more. CINEBENCH is the perfect tool to compare CPU and graphics performance across various systems and platforms (Windows and OS X). Due to a copyright notice from MAXON (the creators of CINEBENCH), we were forced to remove our portable version of CINEBENCH R20. Cinebench R20 and Cinema 4D R20 incorporate the latest rendering architectures, including integration of Intel's Embree raytracing technology and advanced features on modern CPUs from AMD and Intel that allow users to render the same scene on the same hardware twice as fast as previously. Test results can vary slightly because it's impossible to disable every background task of the operating system. These tasks are one factor that may have a slight influence on measurements. Also, modern computers and graphics cards dynamically adjust clock speeds based on environmental conditions like power and temperature. For instance, processors will reduce clock speed when running too hot to allow for cooling and prevent damage. With many modern processors, the reverse is also true. They are able to overclock themselves when the temperature is low enough. Therefore, a system freshly started in a relatively cool environment will typically run faster than the same system that has been performing benchmarks for several hours in a heated office.